This image shows an ancient stone tablet containing rows of numbers, dated from 1800BC. It is written in Babylonian cuneiform script. The modern day versions of the last three columns of numbers are written out to the right. What do these numbers mean? Are there any patterns? Why are they in this order? Is there some underlying structure? The writer of the numbers went to a great deal of trouble to make the heavy clay tablet, so we can be fairly sure that they are important in some way. Investigate these numbers. Create a hypothesis for their meaning or to explain any patterns. Test your hypotheses.Why is it not possible to prove that your hypothesis is true? Note that although there is a very likely answer to the meaning of the numbers, four rows are thought to contain errors in one of the numbers. Can you work out which these are, and can you correct them? If you find the rule which explains all but four of the rows, you might like to consider whether the author had other plans for those numbers or whether, in actual fact, he made mistakes in his calculations or writing. Historians believe that the Babylonians were the first mathematically sophisticated culture. They were active around 3000 - 1000 BC. Whilst their knowledge was basic compared to today's standards, they had discovered many of the properties of numbers and geometry which are still studied in schools today. Attaching meaning to an archeological discovery can be a difficult process. 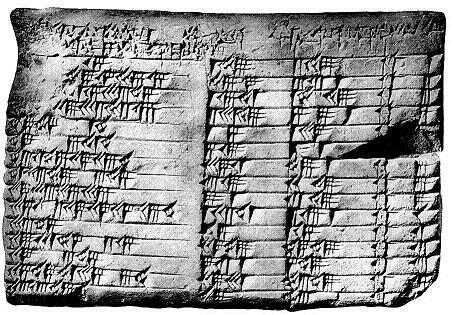 Whilst we will probably never be certain as to the meanings of the numbers in the tablet, mathematicians have found plenty of numerical evidence that they were generated according to a specific rule. This supports the underlying hypothesis to a sufficient degree that many mathematicians are confident that the mis-matched numbers in the table are, in fact, errors which can be corrected. It is these corrected numbers which are often displayed in articles concerning Plimpton 322. Making and testing hypotheses. Mathematical reasoning & proof. Properties of numbers. History of mathematics. Working systematically. History of number systems. Sine, cosine, tangent. History of measurement. Famous mathematicians. Rational and irrational numbers.